Some years ago, some friends of mine in London cooked a particularly memorable meal for me and some other guests. It consisted of Jerusalem artichoke soup, followed by a casserole of chicken, cheese and pudding. I remember the meal well not only because of its excellence, but because of the way it unfolded. The soup, a delicious concoction of mashed up Jerusalem artichokes, stock, onions and cream, was so relentlessly ‘moreish’ that, when asked if we wanted a second, third or even, in one case, fourth helping, I and the other guests eagerly accepted. The result was that by the time the chicken casserole was served, none of us could manage more than an embarrassingly tiny sliver of the bird. It is a curious characteristic of Jerusalem artichokes that while they can taste delicious when consumed occasionally their flavour palls if they are eaten at successive meals. Why this should be so is difficult to explain. It may have something to do with their having quite an assertive and sweet flavour, unlike the potato, for instance. Hence our ability, for instance, to eat potatoes repeatedly, as in ‘chips with everything’. The Jerusalem artichoke (Helianthus tuberosus) is a knobbly root vegetable of the sunflower family which was cultivated as a food plant by indigenous North American peoples long before the arrival of European settlers. Some mystery surrounds its name in English as well as in several other languages. It was dubbed an ‘artichoke’ when the French explorer, Samuel de Champlain, introduced the vegetable into Europe in 1607, describing its flavour as similar to that of the artichaut (globe artichoke), to which it is not related. There are several explanations for the epithet ‘Jerusalem’, but by far the most likely of them is that it is a corruption of the Italian word for sunflower, girasole (a flower that turns to follow the path of the sun, as does that of the Jerusalem artichoke). The tuber is called topinambour in French – and topinambur in Romanian, Italian, Spanish, German and Russian – as a result of yet another misunderstanding. The usual explanation for this historical inaccuracy runs as follows: in 1613 the French navigator, François de Razilly, who had just made an unsuccessful attempt to found a French colony in Brazil, returned to France with six members of a cannibalistic Brazilian Indian tribe, the Tupinambá, whom he presented to the 12-year-old Louis XIII and his regent and mother, Marie de Médicis. It is alleged that because that visit of the Tupinambá coincided roughly with the first appearance of topinambours on French tables, the vegetable was named after them, But that coincidence is not in fact a coincidence at all, for by 1613 the Tupinambá people were already well-known in educated French circles. In about 1562, the great essayist Michel de Montaigne met three members of the tribe and with the help of an interpreter discussed a question that greatly interested him: cannibalism. It resulted in chapter 31, of his Essais, entitled ‘Des cannibales’, which was published in 1595 and foreshadowed Jean-Jacques Rousseau’s subsequent construct of the ‘noble savage’. 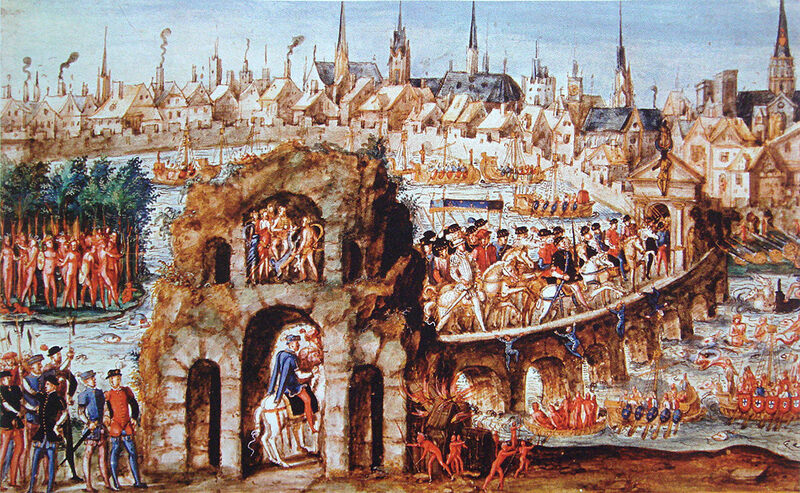 But back in 1550, well before Montaigne’s encounter, fifty members of the Tupinambá had already taken part in a spectacular pageant featuring scenes from their daily life, as well as a ‘replica’ of their village, as part of celebrations for the Royal Entry of Henry II and Catherine de Médicis into Rouen (see illustration). By 1613, whoever gave the new vegetable the exotic name of topinambour was probably not too bothered by the fact that the Jerusalem artichoke in fact originated from North America, not Brazil. Until fairly recently in France, only a few specialised greengrocers sold Jerusalem artichokes (for reasons I shall explain). When I moved from Paris to the largely agricultural department of the Cantal, in the Massif Central, I was keen to get hold of some and try out a recipe or two. Locals told me that I would have no problem in getting Jerusalem artichokes direct from a nearby farm. When I asked the farmer if he could sell me some, he asked: ‘What quantity would you like? Fifty kilos?’ He had automatically assumed I needed the Jerusalem artichokes as pig feed. I told him I didn’t have any pigs. Would it be alright, I asked, if I bought only four kilos. He duly weighed the vegetables, then refused to be paid for them. ‘I couldn’t possibly expect you to pay for that stuff,’ he snorted. Did he not eat them himself? ‘Good Lord, no, we had our fill of them during the war.’ His was not an unusual reaction among the older generation of Frenchmen and women: during World War II, the German occupying forces commandeered most of France’s potato crop to feed their troops. The French were then forced to fall back on Jerusalem artichokes as a nutritious daily substitute. So for many of those who had lived through the war, the vegetable conjured up unpleasant memories of the deprivations of the Occupation. which way soever they be dressed and eaten, they stir and cause a filthy loathsome stinking wind within the body, thereby causing the belly to be pained and tormented, and are a meat more fit for swine than men. Hence the vegetable’s presentday jocular nickname, ‘fartichoke’. Those who like the flavour of Jerusalem artichokes but fear the effects of eating them should keep in mind that they contain the explosive inulin only when they have active new growth on them (as when they have not been stored properly or dug up at the wrong time of year). Eat them in mid-winter, when they are dormant, and you will experience few or no untoward effects. 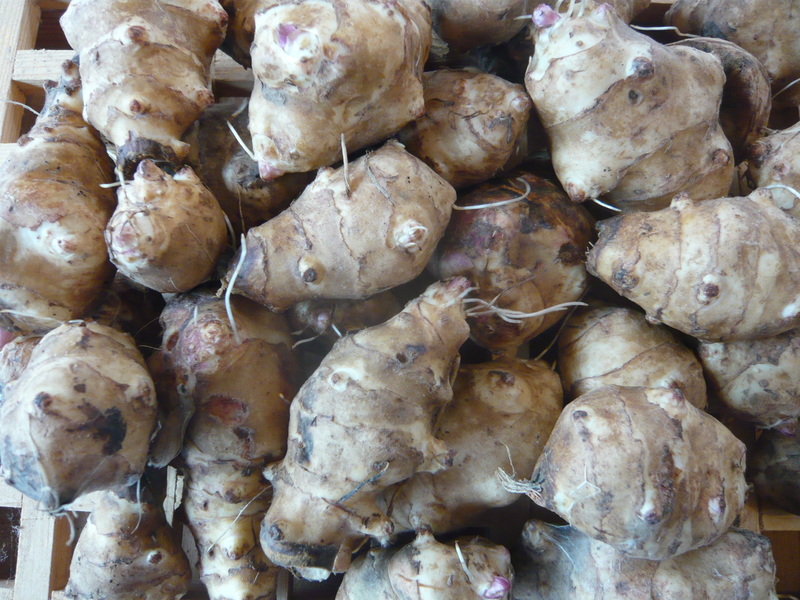 Not surprisingly, the Jerusalem artichoke, a fast-growing and high-yield plant, can be fermented to produce bioethanol, an eco-friendly fuel, at a reasonable cost. Towards the end of the 20th century, a number of leading chefs worldwide began to reappraise such ‘forgotten’ or ‘humble’ vegetables as the parsnip (widely consumed in Britain but regarded as ‘donkey food’ in France), the swede and the Jerusalem artichoke. These vegetables now regularly find their way on to the menus of up-market restaurants and even royal tables . This I discovered the other day while watching a toe-curlingly gushing documentary on French television that claimed to take the lid off the highly secretive principality of Monaco. It turned out to offer no spectacular revelations about the world’s second-smallest state after the Vatican (the programme had clearly been vetted by the Monegasque authorities). But, just as I was beginning to regret having wasted my time watching the programme, an intriguing fact emerged during a sequence which showed preparations for the principality’s biggest annual banquet, that of the Fête Nationale. The head chef was shown consulting the menu he had asked Prince Albert II to approve. It indicated that the entrée would be scallops accompanied by topinambours. On the menu was a handwritten note from the prince, who is a committed environmentalist and clearly an expert on the kitchen garden. He wanted to know which variety of Jerusalem artichoke his chef was proposing to serve to the hundreds of assembled glitterati. Was it Challenger, Fuseau, Stampede or Volga 2? If the farmer I got my Jerusalem artichokes from all those years ago happened to be watching the same programme, I’m sure he must have been totally bemused to discover that what he regarded as pig food was being served to royals.